B’nai Sholom Reform Congregation in Albany will join forces with four other Albany synagogues in a “Mitzvah Day” of volunteerism and social action. 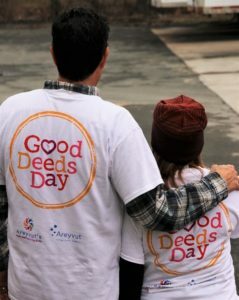 Mitzvah Day is planned for Sunday, April 7. Starting at 11:30 a.m., more than 200 congregants from B’nai Sholom, Congregation Beth Emeth, Congregation Ohav Shalom, Congregation Beth Abraham-Jacob and Temple Israel will gather at Beth Emeth on Academy Road in Albany and then fan out to volunteer at sites around the Capital Region. Participants will spend the afternoon helping with whatever work needs to be done, including sorting food donations at the Regional Food Bank, making bandanas for dogs and cats in local shelters, packing lunches for the Capital City Rescue Mission and numerous other projects at Beth Emeth for more than a dozen organizations and causes. At the end of the day, the congregants from the five synagogues will know that they have made a difference in the lives of so many people. For B’nai Sholom, Mitzvah Day is one way it is fulfilling a recently signed Brit Olam (“Covenant with the World”), a reaffirmation of the congregation’s commitment to meaningful social justice work grounded in sacred and enduring Jewish values. 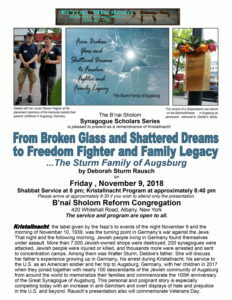 A program of the Religious Action Center of the Reform Jewish movement, Brit Olam makes B’nai Sholom part of a network of more than 150 congregations from Maine to California working in concert to repair the world through moral leadership and congregational and community-based action. For more information about Mitzvah Day, contact Gail Kendall at 40rosedale@gmail.com. Founded in 1971, B’nai Sholom Reform Congregation in Albany is a home for contemporary Reform Judaism in the Capital Region. Nearly 130 diverse households from eight counties seek religious, educational and social fulfillment at B’nai Sholom. 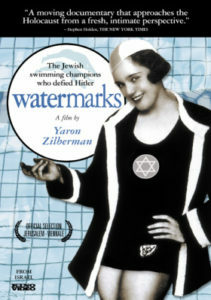 B’nai Sholom Reform Congregation in Albany will present a screening of “Watermarks,” the heartwarming story of the champion women swimmers of the legendary Vienna sports club Hakoah, their survival and their friendship. “Watermarks” will be shown Saturday, Nov. 17, 7:30 p.m. at B’nai Sholom, 420 Whitehall Road, Albany, New York. Refreshments will be available. Suggested contribution: $5. Founded in 1909 in response to the notorious Aryan Paragraph, which forbade most Austrian sports clubs from accepting Jewish athletes, Hakoah rapidly grew into one of Europe’s biggest athletic organizations — and its women’s swim team virtually dominated national competitions in the 1930s. “Watermarks” focuses on the stories of the club’s surviving members, while also faithfully recounting a period where prejudice and violence forced these brave women into exile. Sixty-five years after their escape from Austria, seven members of Hakoah’s female swim team reunited for the first time at their old Vienna swimming pool. Told by the swimmers, then in their 80s, “Watermarks” is about a group of young girls with a passion to be the best. The 84-minute film is in English, German and Hebrew with English subtitles. Film and image provided by Kino Lorber. For more information, visit www.bnaisholomalbany.org or contact the B’nai Sholom office: 518-482-5283 or office@bnaisholom.albany.ny.us. The Brit Olam is a “Covenant with our World because we see the world we want, not the world as it is.” It is a contract to help create “a World of Compassion, Justice and Wholeness.” Further details. The Brit Olam is a “Covenant with our World because we see the world we want, not the world as it is.” It is a contract to help create “a World of Compassion, Justice and Wholeness.” Click here for details.